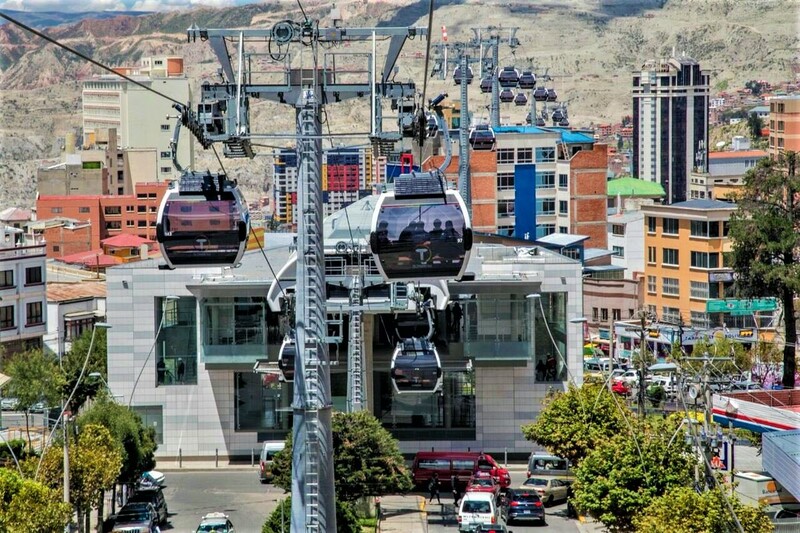 La Paz, Bolivia’s newest gondola rises above traffic as part of the city’s innovative elevated transit system. Under blue sky at 12,000 feet, the President of Bolivia pressed start at high noon yesterday for Línea Blanca, the newest gondola in the world’s urban ropeway capital. Surprising thousands gathered for the occasion, President Evo Morales then proceeded to inaugurate the first section of the Sky Blue line, initially slated to open later this year. The day was momentous as seven color-coded gondola lines now stretch contiguously throughout La Paz and El Alto with no significant gaps between them. From this weekend, Mi Teleférico (My Cable Car) includes approximately 140,000 feet of haul rope, 962 gondola cabins, 168 towers and 26 stations. The scale is almost unbelievable and there are still four more lines in development! Built by Doppelmayr like most of Mi Teleférico, the White line services four stations with 131 10-passenger cabins. It’s capable of transporting 3,000 passengers each hour on a 13 minute trip between the Sky Blue (Celeste) and Orange (Naranja) lines. The initial section of Celeste was once planned to be part of a four-section White line which was later split to serve additional neighborhoods and prevent any one line from becoming too congested. Like most of the world’s largest gondola system, I’m pretty sure the White Line is made up of two separate haul rope loops and vault drive systems with cabins that rotate through both. The northernmost station is the first underground ropeway terminal in the world and shared with the Línea Naranja, which opened last September. From here, the White line travels along Busch Avenue to two elevated stations, one of which will be shared with Línea Café. At the Plaza San Martin, the line angles slightly right before diving into a canyon that is also an urban green space. It is here the Sky Blue line will cross in two directions. After just a few minutes headed south on Celeste, passengers arrive at Libertador, one of only two spots in the network where three lines converge. The White line will cross over the Sky Blue line, which you can see towers for below. Two more years of construction lie ahead in La Paz before all $740 million worth of gondolas are operational. Maybe then I will trek down to ride them all. Next Article As LiftDigital Spreads, Are We Viewing the Future?